Internal doors can completely transform your home, wither you’re replacing internal doors or adding internal doors into a new build – internal doors can create a completely different feel to your home without needing to redecorate the whole house. When looking at internal doors, there are a number of different things to consider. From size and functionality to style and insulation performance, there are so many options that it may be overwhelming. Here at Door Superstore we’ve created a guide to some of the things you should consider when choosing internal doors, to help make your decisions a little easier. Do you need a fire rated door? Fire rated doors have been manufactured to act as a barrier, preventing the spread of fire for at least 30 minutes – FD30 rated fire doors give at least 30 minutes of fire protection, whilst FD60 fire doors give at least 60 minutes of fire protection. For new build properties, fire doors must be installed where an integral garage can be accessed from a 2 storey house, or where any room leads to a stairway in 3 storey (or more) houses – this criteria would consider a loft conversion to be a storey. For more information on when fire doors are required, check out our guide to how fire doors work. 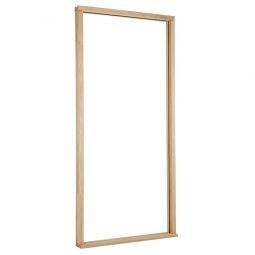 Fire doors can also be installed when they aren’t required by building regulations – they are thicker than regular doors, meaning that they are often of higher quality, and provide good soundproofing. Take a look at our post on the other benefits of fire doors. 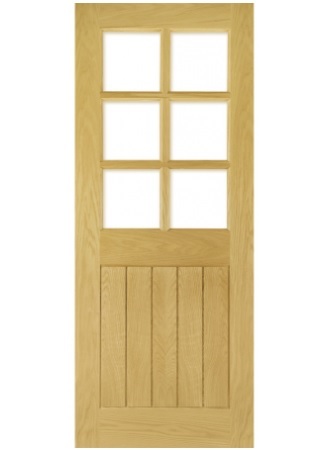 Panelled internal doors have been constructed with a number of different panels instead of a single piece of wood. Popular in homes and buildings throughout the UK, panel doors have a structure that provides stability and durability, as well as variety – you can choose from 2, 4 or 6 panelled internal doors for your home. Would an internal glazed door suit your home? 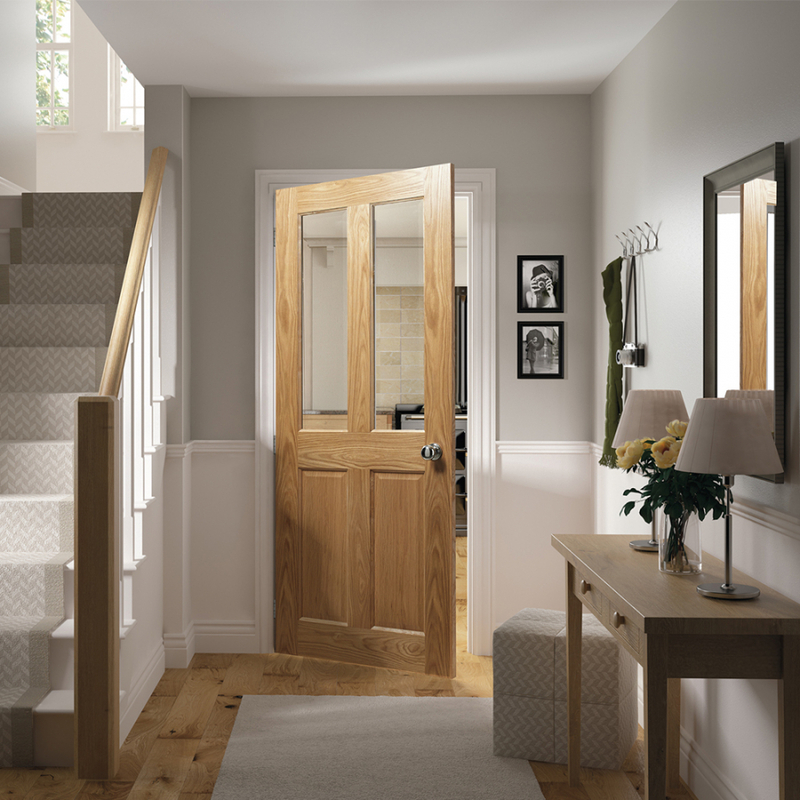 Internal glazed doors can be the perfect way to brighten up a room or hallway, letting natural light flow through the house even when doors are closed. 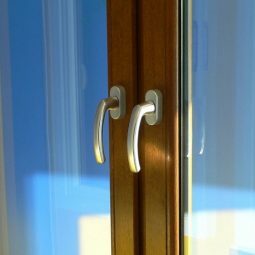 Choose from internal glazed doors with full glazing, half glazing or glazing panels depending on the amount of light you want to flow through the glazing, and you can also choose from clear, obscure or frosted glazing depending on the levels of privacy you require. Alternatively, opt for an unglazed door and fit the glazing yourself, which will allow you to add your own personal touch to your internal doors. If you’re looking to create a feature, stained glass is a nice way to bring a unique touch to your door. Have you considered different colours for your internal door? Internal doors come in a range of different colours, and choosing a colour you may not have previously considered could completely transform a room. Along with traditional internal doors in simple wooden or white finishes, there are other colours such as ash grey, light grey, dark walnut and more that are becoming increasingly popular. To fully transform a room by replacing the internal doors, don’t forget the door accessories and hardware! Picking the right door handles, door knobs or door frames can add a new dimension to the room as well as the door. 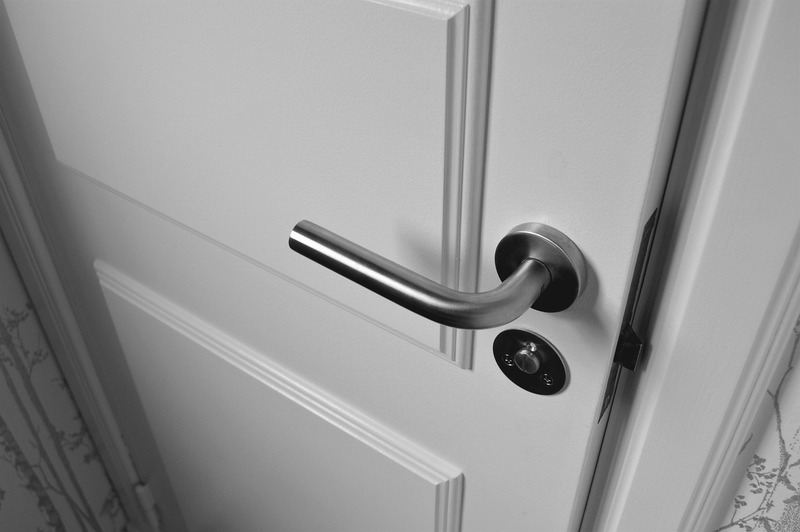 Door latches are not often supplied with new doors, so it is important to remember to purchase latches for your internal doors too, as well as door handles and door knobs. 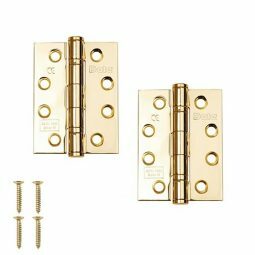 We’ve got a range of different latches to choose from, including bathroom latches, mortice latches and a number of fire rated latches for use on fire rated doors. Need some help picking the best internal doors for your home? Our team are more than willing to help, simply call 01752 422501 or use the live chat in the bottom right hand corner.